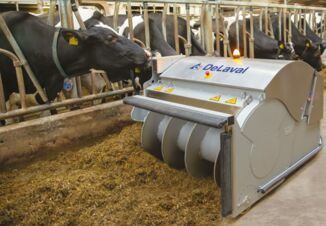 Dairy Sense: Know Your Herd’s Feed Costs? In today’s challenging dairy industry producers and consultants are looking for the ever-elusive silver bullet that will make a farm profitable. Conversations usually center around the newest research related to forages and nutrition that will promote higher levels of milk production. Then there are the costs. With reports of commodity prices coming down, and the encouragement that feed costs will be lower, what does that really mean? For almost two years the Extension Dairy Business Management Team has been working intensively with twenty-four very well managed dairy operations to evaluate their whole farm system. 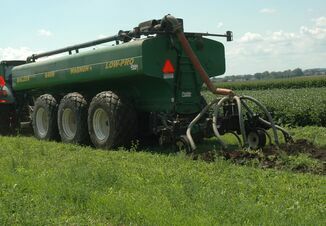 One of the goals is examining crop and feed metrics to determine any association with the farms’ profitability status. A FINPACK analysis was completed on all farms for 2016 and their breakeven cost of production was determined. There were two sampling periods (2016/2017) when the corn silage and TMR were analyzed and the ration fed and milk weights were recorded. The farms’ breakeven cost of production/cwt from 2016 was used for comparison with the milk price received at the two sampling periods. This was used as a barometer to determine a positive or negative cash flow. In the first sampling period (December 2016 – April 2017) there were ten farms with a negative cash flow ranging from -$0.16 to -$3.40/cwt. Total feed costs including home raised and purchased for all animal groups as a percentage of milk income averaged 58 percent. The range went from 44 to 75 percent. 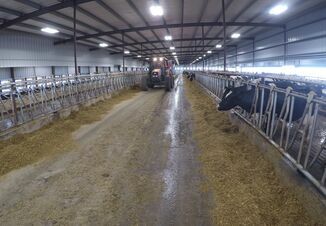 The fourteen farms showing a positive cash surplus (+$0.09 to +$3.22/cwt) had average feed costs as a percentage of milk income at 53 percent (range 45 to 66 percent). The energy-corrected milk averaged 83 pounds for the positive cash flow herds versus 78 pounds for the herds with a negative cash flow. During the second sampling period (April – September 2017) milk prices had dropped and now there were fourteen farms with a negative cash flow ranging from -$0.14 to -$6.21/cwt. The positive cash flow farms ranged from +$0.26 to +$2.50/cwt. Similar to the first sampling period, the same trend showed up in milk production and feed costs, with the positive farms showing higher energy-corrected milk (82 vs. 79 pounds) and lower feed costs as a percent of milk sales (51% vs. 58%). Focusing on the lactating cow rations, herds in both the positive and negative cash flow categories on average fed the same corn silage dry matter pounds (19-20 pounds) coupled with similar amounts of hay-crop and/or small grain forage. The pounds of fiber, digestible fiber, starch and digestible starch coming from the corn silage were very similar between the positive and negative cash flow groups. The majority of herds fed an energy and protein ingredient separate from the grain mixture with many feeding either high moisture or dry cereal grains and at least one protein ingredient separate from the grain mix. The $65,000 question begging to be asked: “Is there a single metric that equates to profitability and milk production?” Unfortunately the answer is no, and the rest of the story is probably not going to be very palatable. The data supports our business management team’s observations over many years. High quality corn silage defined as having high fiber digestibility and/or starch digestibility and fed at high amounts (>20 pounds dry matter) does not guarantee high milk production or profitable herds. In fact, our observations show the highest performing herds with a positive cash flow are sometimes feeding the lowest quality corn silage using fiber digestibility as the metric. The key point that many people want to overlook is good management is needed on cropping, feeding, AND financials. The positive cash flow farms are doing a good job on the home-raised feeds including quantity produced. Purchased feed costs are kept in line for ALL animal groups. Our data show that many different approaches are effective at producing high levels of milk production and keeping feed costs in line. Monitoring feed costs is important, but the big picture gives producers the most bang for their buck, not nickel and diming unit costs associated with commodities and other inputs. Having adequate forage inventory to feed a consistent diet can be just as important as achieving the highest possible nutrient analysis. The formula for profitable herds: know the breakeven cost of production – monitor income over feed costs monthly – make decisions using these numbers. Goal – Determine the costs to produce home-raised feeds and the amount of purchased feed going to all animal groups. Step 1: List crop type, acres and tonnage for the current year. Step 2: Compile the list of recently purchased commodities, complete feeds, forages, grains for lactating and dry cows and calves and heifers. Step 3: From the current chart of accounts, list appropriate costs for each crop including seed, chemical, fertilizer, custom hire and land rent. Step 4: Compile the overhead expenses for the operation. Step 5: Using the Penn State Excel spreadsheet or fillable pdf form, complete the ration and crop section. Step 6: Complete the annual cash flow to determine the operation’s breakeven income over feed cost/cow and margin/cwt. Step 7: Use this information during profit team meetings with the appropriate advisors. Note: Penn State’s October milk price: $18.31/cwt; feed cost/cow: $5.36; average milk production: 81.0 lbs.